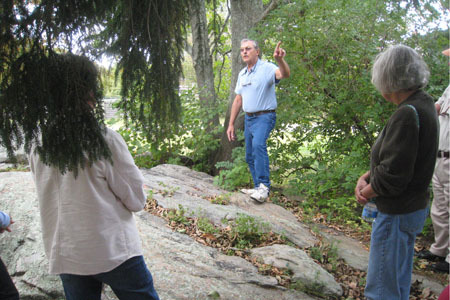 It is important to recognize that the environment is the enjoyed feature in a natural park like Canonchet Farm. It is the most vital consideration that directs our decisions concerning every type of use proposed for the park. As we have stated many times, the first and most important step in the development of a master plan is consideration of the uses to which the property will be put. The Town Council did not address this critical starting point directly in its deliberations, but from the comments made and votes taken, we can see this aspect of the plan taking shape. However, we consider it extremely important that the master plan detail the specific activities to be allowed and prohibited in the park. The general consensus of the Town Council and, perhaps more importantly, the many citizens who gave public testimony, seems to be the acceptance of the notion that this should be an area of the town devoted to passive recreation, education and enjoyment and not a gathering place for large crowds of people. The unique topography of the land and the environmental sensitivity of fresh and salt water wetlands in close proximity to one another make such intense use inappropriate. Still, one of our goals should be to promote an increase in the use of Canonchet Farm by a greater number of our citizens and visitors. Public pressure for alternative uses will continually threaten the property unless the improvements we employ are designed specifically to encourage increased low impact uses. The Council appropriately ruled out public camping as a possible use of the property early on in recognition that such intensive use would be detrimental to the property and perhaps the town as a whole. We support the South County Museum as a tremendous asset to the town. Any expansion of this use should clearly be done in conjunction with the museum’s needs and desires, and that includes any consideration of reconstruction of the carriage house. It is our hope that a nature center/visitors’ center will be developed within the museum complex. The location of an observation tower, if it is to be built at all, should be determined at some future date if and when funding becomes available. The development of a linear park along Boston Neck Road is one of the least controversial aspects of the plan and one which enjoys widespread support. The Friends of Canonchet Farm (FOCF) supports this element of the plan completely, as it meets the goals of visibility and greater access and will serve to beautify this most visible area of the farm to residents and visitors alike. Although the Council seems to have delayed the elimination of the employee parking lot, it appears that it will have to be relocated. There is little reason to do all the work to create a beautiful park environment in this area and leave such an eyesore and environmentally damaging element in place. One appealing element of the linear park will eventually be handicapped-accessible walkways circumnavigating these ponds. FOCF members have begun bi-weekly testing of the waters of Lake Canonchet and Little Neck Pond in coordination with Watershed Watch/URI and with the able assistance of Dr. Veronica Berounsky, Marine Ecologist, URI/Graduate School of Oceanography. This is a critical step in deciding what type of environment we are dealing with in order to understand what regulations apply to our efforts in this area. Initial reports indicate that these are fresh water ponds, even though they do have a connection to Pettaquamscutt Cove, a salt water estuary. This information will help guide the town in the process of obtaining necessary environmental permits for future improvements. There are two surveys that have to be completed before planning future uses of the property. One of these is a wetland survey, completed this year with funds provided by the Friends of Canonchet Farm to the town. We await final mapping of this information. Equally important is the location and mapping of all important natural, geological, historical and cultural features of the park that require preservation. Until this is done, no real plans or activities can be undertaken for any future development without risking the permanent loss of such critical assets. We consider the development of gardens, fishing piers, and docks to be noncontroversial, and therefore we have only a few specific suggestions at this time. We do feel that development of gardens should be limited to the museum complex. Implementation of these elements must take into consideration the restoration of a coastal environment within the farm, and any changes must adhere to this overall purpose. The nature trails that currently exist within Canonchet Farm are being well maintained and improved by the Narragansett Tree Society with tremendous contributions of time and labor from its volunteers, including the Boy Scouts. The Friends of Canonchet Farm applauds and supports these efforts and looks forward to working in harmony with the Tree Society as the trail system is expanded in the future. Guided tours, natural and cultural education programs, environmental management training workshops, educational literature and signage will be necessary to acquaint people with the features and needs of the park. These programs will draw users into a deeper commitment to the park and spread the word about Canonchet Farm.